Some say the foundation of dating has radically evolved over the years. From arranged marriages and chaperoned strolls to speed dating and online profiles, while the method is different, the end goal remains the same: everlasting love. What allows us to differentiate ourselves in the digital age is our ability to play the game of Love Life. Though parents and hierarchy used to create couplings, nowadays we have the opportunity to place our own bets. 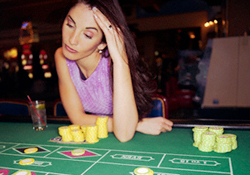 As any high roller will tell you, it’s a numbers game out there — and a serial dater will agree. For one month, aim to go on a date with one person a week. Given that it’s a different person each time, that’s four chances of finding “The One.” If you were to up that to two people weekly, you double your chances. A serial dater knows that increasing the number of those in his or her dating rotation will increase the odds, not only because of the act of dating itself, but because of the domino effect of networking. Ever hear of six degrees of separation? We’re all connected somehow, so the more you connect, the higher your chances! A horse race card contains details about the horse race, like the number of races, names of the horses, etc. A serial dater will collect as many race cards as possible. Don’t expect him or her to put their eggs in one basket — the odds won’t always be in their favor. There’s a 50/50 chance of denial and no one likes rejection! But what a serial dater knows best is that by looking at the stats, they can make an educated guess when betting on the right horse … err, person. And that way, they’re prepared for the ultimate gamble. A seasoned poker player might be able to keep a straight face, but like anyone proposing (or receiving a proposal) there’s no denying a racing heart. By playing the odds and filling a race card, a serial dater has the undeniable advantage in the dating field. He or she has figured out exactly what they want and the person who they want to be with: a safe, long term bet that they’re willing to go all in for.